The Tudor Heritage Chronograph watch was unveiled at BaselWorld 2010, one of the most prestigious expositions in the watchmaking community, and it features a decidedly retro look; as it should, as Tudor has dug into its own extensive history for the design of this unique watch. The Tudor Watch Company, owned by world-renowned watchmaker Rolex, was created by Rolex founder Hans Wilsdorf in 1946 to offer a more affordable option compared to the Rolex brand while still retaining the reputation for dependability that Rolex enjoyed. Tudor quickly carved out a successful niche in the watchmaking business and flourished throughout the ’50s and ’60s. Eventually, in 1970 they would release the watch that would be the inspiration for the design of the Heritage Chronograph; a watch that stood out both for its style and the technology it utilized, the Tudor Oysterdate Chronograph. Although 40 years have passed since the Tudor Oysterdate Chronograph, the style it championed is present once again in its successor, the Heritage Chronograph. The watch is strikingly similar in design as to its predecessor’s; a casual glance wouldn’t be sufficient to discern the two. The dial is marked similarly and the watch movements are placed identically (small seconds at 3 o’clock, date at 6 o’clock and a 45-minute totaliser at 9 o’clock) and the color scheme is nearly identical. The Heritage Chronograph does update these features with a more contemporary design, despite its similar appearance. The lugs are beveled and polished, the watch has crown protectors, a knurled bezel and chronograph pushers as well. The Heritage Chronograph isn’t simply a reproduction of the Oysterdate Chronograph with a new name as much as it is an evolutionary step for the design and a model in its own right. 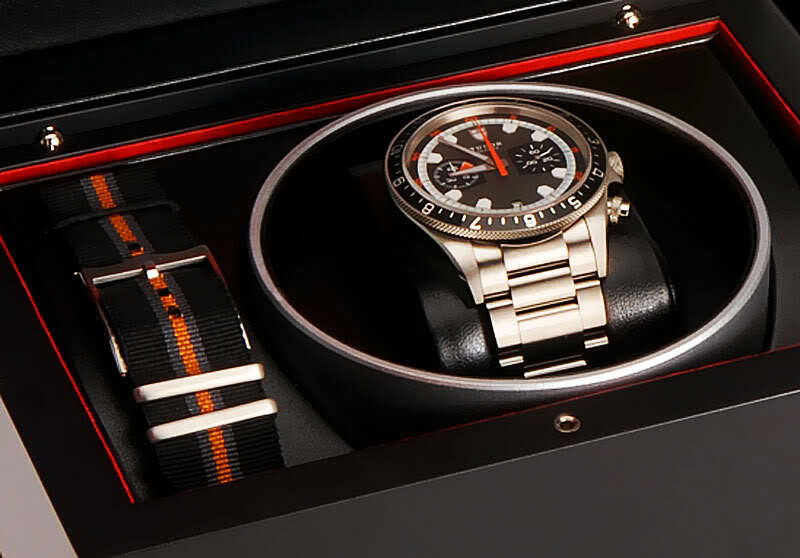 Offering the dial in either black-on-grey or grey-on-black designs, using a black eloxed aluminum disc for the bi-directional bezel, the three-linked solid steel bracelet featuring the Tudor shield logo and a new clasp as well as a seat-belt inspired black, grey and orange fabric strap are some of the more contemporary design implementations that separate the Heritage Chronograph from the Oysterdate Chronograph. 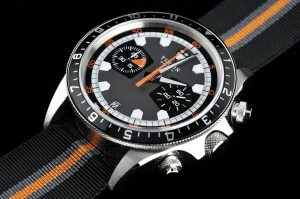 Tudor Heritage Chronograph in its case with both the steel bracelet and fabric straps. 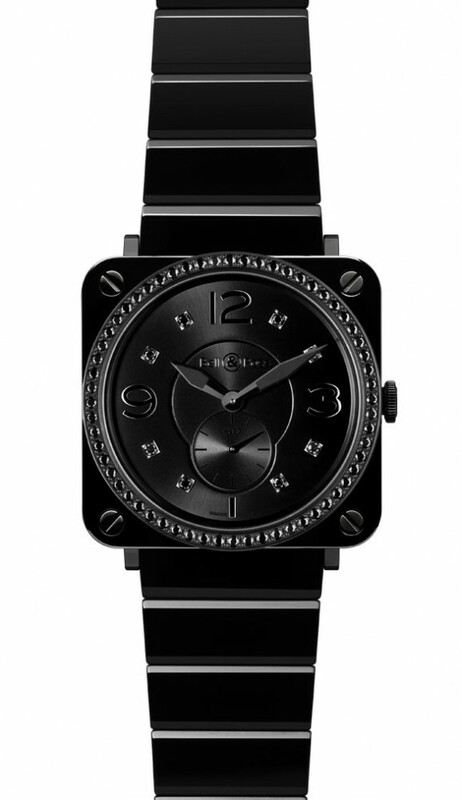 colored dial, regardless of whether you choose the black-on-grey or grey-on-black design, pop visually. The steel bracelet offers a more traditional look, in line with its contemporary, but I feel the fabric strap makes for a more visually striking timepiece, overall. Also worth noting about the straps is that they are “meticulously fashioned by a company that perpetuates an over century-old artistic craft,” according to the Tudor website (they also have a video showing the production of the straps). The Tudor Heritage Chronograph features a self-winding movement with a boasted reserve of 42 hours. Tudor also claims the watch to be waterproof at depths of up to 150 meters. Throw in the price tag of roughly $4000 and you are offered a watch built to Rolex quality certifications but with a more palatable price tag. 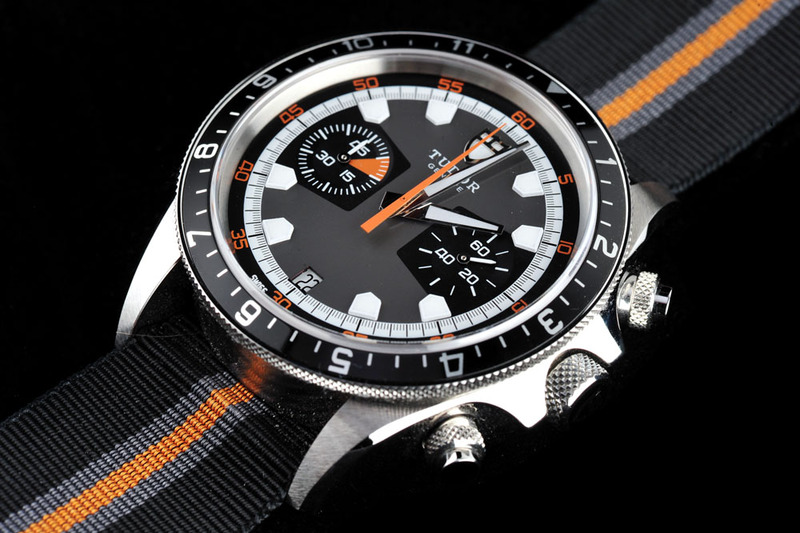 Unfortunately for anyone interested in the retro-inspired Tudor Heritage Chronograph, the Tudor brand as a whole isn’t offered in Great Britain or the United States, so you may have trouble getting your hands on one of these beautiful timepieces. But, I can think of worse excuses to take a trip to Europe than to get your hands on a watch like this one. At a special exhibition in May 2012, German luxury watchmaker Glasshüte Original unveiled its most ambitious and complex timepiece yet, the new Grande Cosmopolite Turbillon watch. Glasshüte Original itself describes the Grande Cosmopolite Tourbillon watch as being, “the most unusual and sophisticated masterpiece in [its] history,” released in a very limited edition comprised of just 25 pieces. At first glance, the appearance of the Grande Cosmopolite Tourbillon certainly supports the company’s statement, the watch displaying a somewhat overwhelming assortment of windows, dials and knobs on its face. In fact, the Grande Cosmopolite Tourbillon is as technically complex as it looks, but has been cleverly designed with usability in mind, the timepiece particularly geared toward world travelers or those whose lifestyles span multiple time zones at once. Although featuring multiple complications, they are easy to adjust, making this watch unique and aesthetically interesting, while also functional for the modern sensibility. For years, developers of the Grande Cosmopolite Tourbillon had been working to find a way to harmonize the various mechanisms encompassed within this timepiece. The watch can display the time in two different zones at once, interestingly, set using the IATA or international airport codes and including all 37 time zones of the world. Those who do not have all the IATA codes memorized need not fret, as they are engraved on the watch’s platinum case-back. 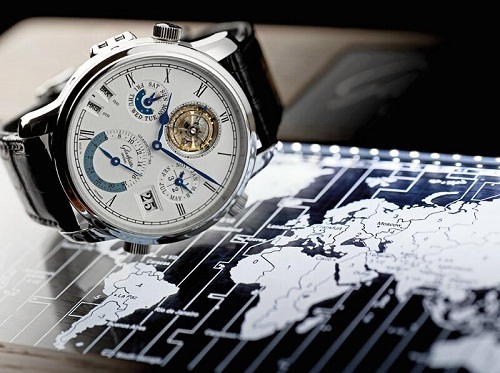 The Grande Cosmopolite Tourbillion timepiece uses international airport codes (IATA codes) to display time zones. The IATA codes for various cities are engraved on the watch’s caseback for reference. When setting the time including the IATA codes, the watch is able to adjust for standard time and daylight savings time, as displayed in the two windows at the bottom left region of the dial, and the time in one other zone. Further, it can be set to move backwards or forwards depending on one’s westward or eastward travel direction, respectively, utilizing a knob at the 2 o’clock position. The dial displays the month, date, and day of the week, also adjusting to time zone changes, this watch essentially requiring no work or thinking, perfectly suited for the weary world traveler. 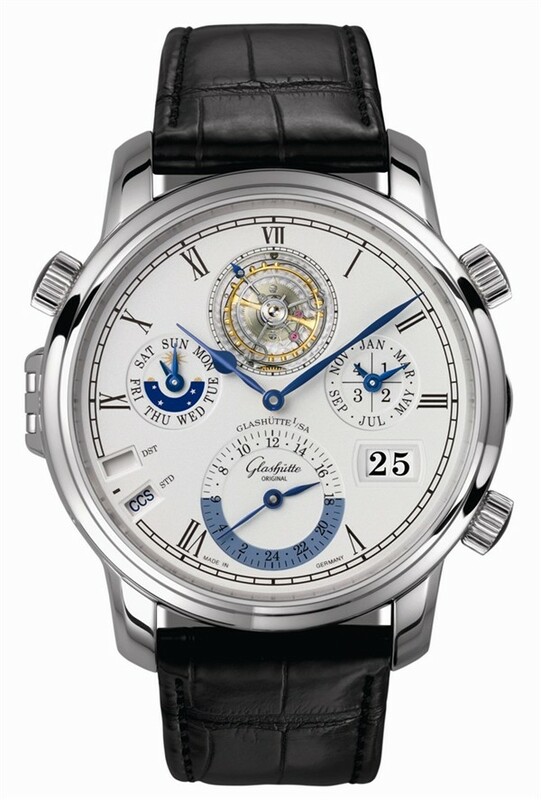 The Grande Cosmopolite Tourbillion is an attractive watch, its circular 48 mm dial featuring elegant Roman numeral marks set on a simple white background, pleasing blue coloring on several of its displays and incorporating a gold flying minute tourbillion as an homage to Glasshüte Original’s legendary watchmaker Alfred Helwig. With four patents pending to protect the unique features developed specifically for this intricate timepiece, Glasshüte Original presents one of the most impressive luxury world-time watches to date with its Grande Cosmopolite Tourbillion. 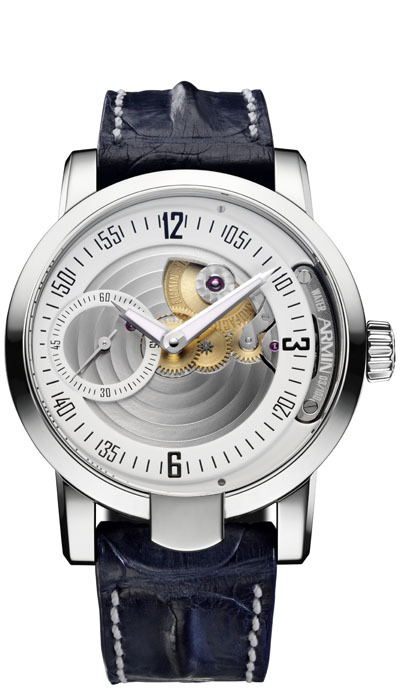 The release of this timepiece marks Glasshüte Original’s position as an important, forward-thinking watchmaker to look out for both in the present and into the future, even reflected in Glasshüte Original’s promise to replace the Grande Cosmopolite Tourbillion’s internal IATA disc in the case that nations decide to change their time zone designations. 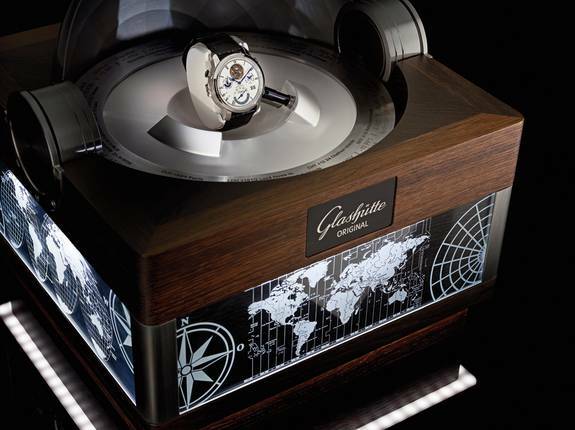 This limited edition watch is presented in this impressive, globe-esque box. In a limited edition set, Louis Vuitton adds to its Tambour Bijou women’s watch collection a new ‘secret’ timepiece aptly called the Tambour Bijou Secret. The characteristic that makes the Tambour Bijou Secret watch ‘secret’ emerges out of the watch’s appearance, seemingly being at once a jewel and a watch. The timepiece consists of two layers, the first of which pivots to reveal a watch dial ‘hidden’ underneath. The Tambour Bijou Secret watch comprises a simple, but elegant flower shape on both of its layers, the top being a flower with rounded petals and the bottom having a flower with pointed petals. Both layers are carefully encrusted with diamonds, greatly contributing to the watch’s stunning and glimmering appearance, without being overtly ostentatious. This timepiece, rather, is the epitome of femininity and class, with a feel that is both timeless like a jewel and modern as a watch. Being largely inspired by jewelry, the Tambour Bijou Secret watch has a rounded shape with a small size of just 22mm, akin to a jeweled bracelet as much as to a timepiece. The Tambour Bijou Secret timepiece comes in three versions, each demonstrating Louis Vuitton’s careful and advanced mastery of the delicate materials the company utilizes in its pieces. The different versions consist of: white gold and mother-of-pearl, rose gold and Polynesian mother-of-pearl, and white gold and mother-of-pearl with a special strap fully encrusted with about 6 carats of diamonds. As all three versions appear very differently, choosing between them could prove a difficult task, as they are all equally stunning and elegant. Louis Vuitton’s Tambout Bijou Secret timepieces come in three versions, from left to right- white gold and mother-of-pearl, rose gold and Polynesian mother-of-pearl & white gold and mother-of-pearl with a 6 carat diamond encrusted strap. The hidden dial of the Tambour Bijou Secret consists simply of two hands and no markings, the watch serving the timekeeping function without being out rightly done so. The dial is also marked with the brand name Louis Vuitton, a reminder of the luxury and high quality nature of this product. Each watch comes with two different straps, a patent Monogram triple-tour and an alligator strap fit to seamlessly match each particular version of the Tambour Bijou Secret timepiece. Launched to great success and acclaim in 2006, the Tambour Bijou watch collection has become a staple product of Louis Vuitton’s impressive repertoire. The company proudly introduces the Tambour Bijou Secret women’s timepiece in this light, a limited edition watch that encapsulates Louis Vuitton’s technical and creative mastery when it comes to producing accessories that are timeless, elegant and luxurious. In celebration of German watchmaker Junghans’ 150th anniversary, the company will release in July 2012 the Meister Handwind timepiece, a revamped version of the company’s 1930s era models. Junghans Meister Handwind, or ‘Meister Handaufzeufg’ in its German moniker, is a simple and classic dress watch in both its appearance and technical aspects. The watch’s 37.7mm case is uniquely thin at just 7.3 mm, adding a hint of elegance and uniqueness to the timepiece itself. The Meister Handwind watch features a thin, circular crown that has a simple, subtle knob coming from the right-hand side for its manual winding movement. The white dial, which is tucked under domed crystal, features long elegant lines to mark the hours and a subdial just underneath its center indicating the seconds. This timepiece comes in three different colors, each, while not wildly different, evoking its own elegant feel. The difference between the versions can be seen in the color of the crown, matching the hands and the quarter-hour markings, with buyers having a choice of silver steel, a shiny gold, or a more bronze-gold color. 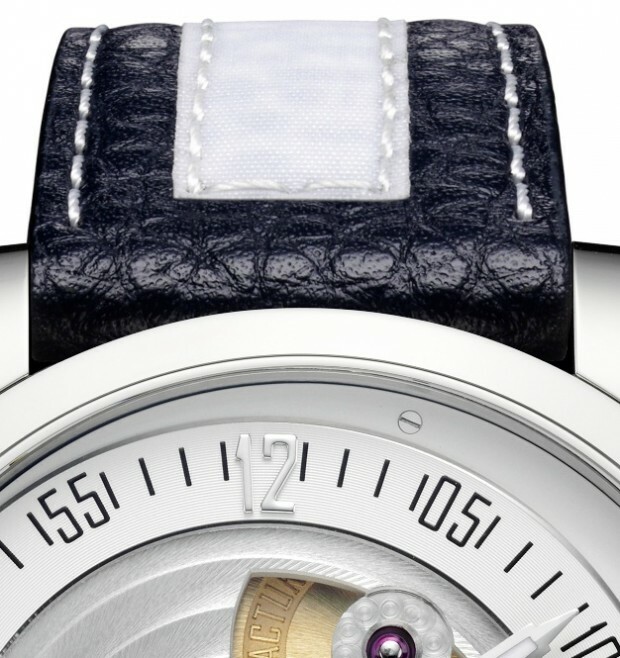 Through mineral crystal on the back of the case, the watch’s movement and technical aspects can be viewed and admired. 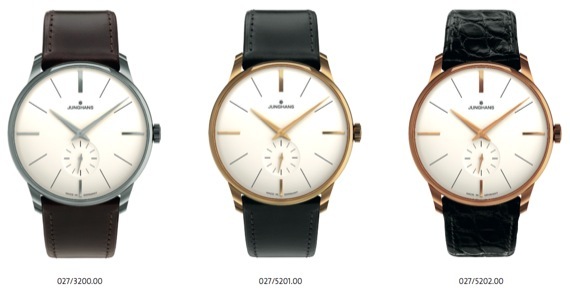 Junghans Meister Handwind watch comes in three colors. As a commemorative, but newly released watch, the Meister Handwind simultaneously appears modern, while making reference to the retro, perfectly combining both Junghans heritage and seeing the company’s movement into the future. Unlike many men’s dress watches, which hope to show off and draw attention, this watch holds the fine quality of being both understated and masculine, a balance that can be difficult to strike. 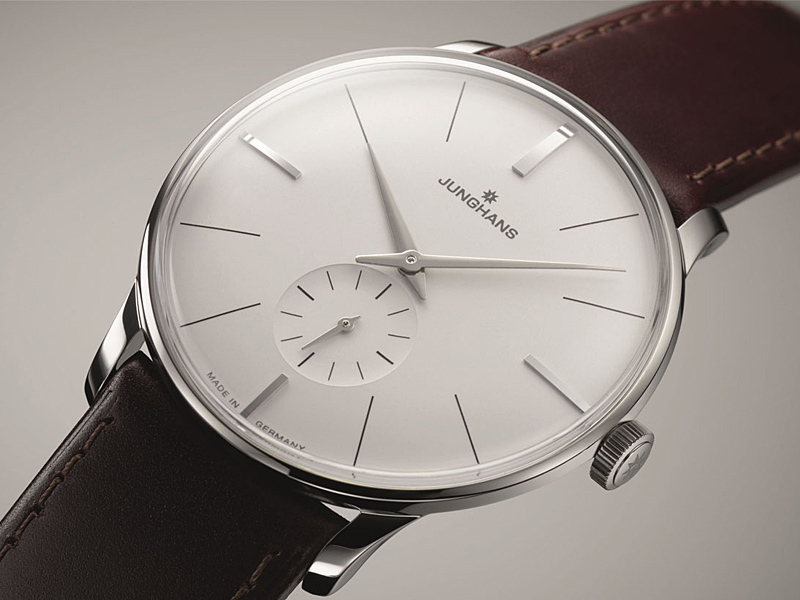 At a retail price ranging from 950 to 1.050 Euros (approximately $1,183 to $1,300), Junghans Meister Handwind timepiece is extremely affordable relative to other men’s dress watches. Watches similar to this one, such as Piaget’s Altiplano watch or Jaeger-LeCoultre’s Master Grande Ultra Thin timepiece, tend to be priced significantly higher at about $19,000 and $5,000, respectively. For the man not expecting to wear a luxury dress watch on a daily basis, the Junghans Meister Handwind timepiece presents one of the best deals available. As one of Germany’s premier luxury watchmakers, this milestone marks a great achievement for Junghans, appropriately celebrated with the release of the Meister Handwind timepiece in July 2012. As an elegant, understated dress watch, this timepiece is slated to be a classic of Junghans collection, fit for the modern man with an appeal for the retro. Swiss watchmaker Armin Strom AG presents a new generation of its Armin Manual Water watch, a timepiece attempting to achieve perfection in both the technical and aesthetic components. The Armin Manual Water watch is part of a collection of four Armin Manual watch models, each representing one of the four elements: Earth, Water, Air and Fire. While each of the models shares the same design and functions, they are distinguishable by color, giving each its own personality. The Armin Manual Water, in this way, evokes a sense of fluidity and clearness, featuring shiny stainless steel on its 43mm case and in its dial, along with some white and bright gold, giving the watch an overall brightness. Unique to Armin’s Manual watch collection is the watches’ unique design with a slightly off-center time display, sleek numerical markings and a partially open area showing off its mechanical workings. Armin Strom, from whose work the company is based, has been considered an innovator in the field of skeleton watches for decades, bringing to his timepieces a feel of the high-tech and modern, and making them continually interesting to look at. Such is the case for the Armin Manual Water watch, which also incorporates a small subdial ring, bringing together well the watch’s various circular patterns and overall round shape. The Armin Manual Water watch is further distinguishable from the other models due to its navy blue, ‘hornback’ alligator strap. Recently, the Armin Manual Water was adapted in a special limited edition series of just 40 pieces in celebration of Armin Strom’s sponsorship of the GAC Pindar Sailing Team and the team’s participation in the Extreme Sailing Series. This special edition version of the Armin Manual Water watch features the authentic white canvas of the GAC Pindar catamaran stitched onto its navy blue strap. The Armin Manual Water Watch lacks the fancy gimmicks commonly found in luxury timepieces, appearing at once simple and aesthetically pleasing, with Armin playing to a modern, design-concerned sensibility. However, with such capabilities as a 120-hour power reserve and an advanced mechanical system, the timepiece does not fail to impress with its high-tech inner workings. Although Armin Strom AG has only been in existence since 2006, the company is already making a splash in the watch industry with such timepieces as the Armin Manual Water watch, as well as, with the other models of this enticing Manual watch collection. Elegantly melding the aesthetic and technological, the Armin Manual Water watch represents the innovation that has come to mark the future of luxury timepieces. 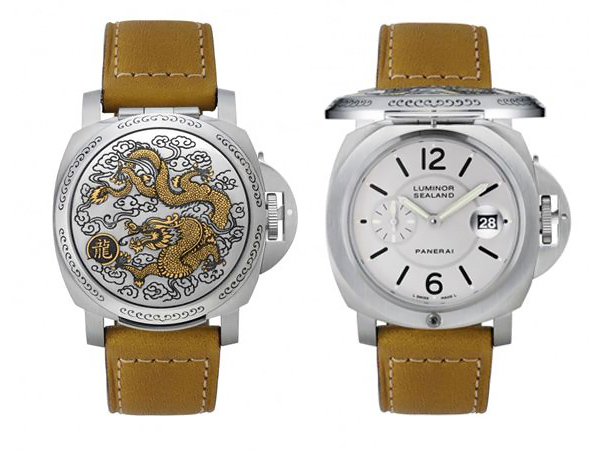 Aimed at the Chinese market, the Panerai Luminor Sealand Dragon Watch (PAM 840) was crafted to represent the essence of Chinese culture and style. Humble in appearance yet complex in design. The PAM 840 is designed with a spring-loaded lid over the watch face hinged at 12 o’clock. This lid features an intricate gold plated engraving of a dragon. Hand crafted by the sister brand of Panerai, James Purdey and Sons of London. The detail and elegance of the engraving sets the PAM 840 apart from its competitors. While many other watches display dragons and Chinese characters, Panerai’s Dragon watch attests to its manufactures level of skill and dedication to luxury. Upon lifting the engraved lid you will notice a textured steel dial on the right side used to move the clock hands. The lid also contains a mirror underneath it; I would say that it is just an extra feature. It is really up to the user how and what they use the mirror for, not a necessary feature but neat to have. The clock face itself is actually very simple in design. With the white background, black hour markers and a brown leather bracelet strap the clock is as simple as it gets. One setback for the watch is that although the watches hour and second markers come with the famous Panerai luminosity, the fact that most of the hours and all of the second markers are dots and lines will make it hard to tell the time in low light conditions. Like most of Panerai’s watches, The PAM 840 is powered by the Panerai’s OP III movement and in this case it’s also housed in a ‘Sealand case”, a case similar to that on the ‘Hunter’ style case 44mm Luminor. Panerai has not yet released a price for this model. Although, it is a limited edition so you will have to find a local Panerai boutique to get a quote or contact Panerai’s main headquarters located in Milan, Italy for more information. Since Panerai’s founding in 1860 in Florence, Italy the company has become one of the world’s leaders in high end designer watches. Each year Panerai designs a watch for a certain part of the world. This particular edition was designed for the Chinese market. It is intended for those who want simplicity yet worthy craftsmanship. In fact only 50 of these will be made for China. In an effort both charitable and creative, Audemars Piguet is auctioning eight stunning, one-of-a-kind Royal Oak Wall Clocks to raise funds in support of ongoing relief work following Japan’s devastating 2011 earthquake. 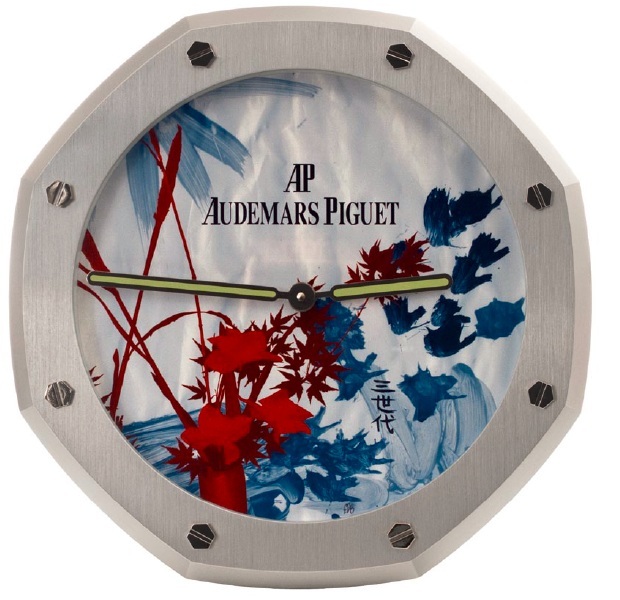 After the earthquake struck, the North and South American divisions of Audemars Piguet commissioned eight artists to each design a Royal Oak Wall Clock as a gift for the company’s Japanese division. What came out of this project was eight beautiful, unique and inspirational works of art, all set on Audemars Piguet’s iconic and beloved Royal Oak Wall Clock. The designs all carry significant messages according to the artists’ individual perspectives and reflect the Japanese spirit in some way. 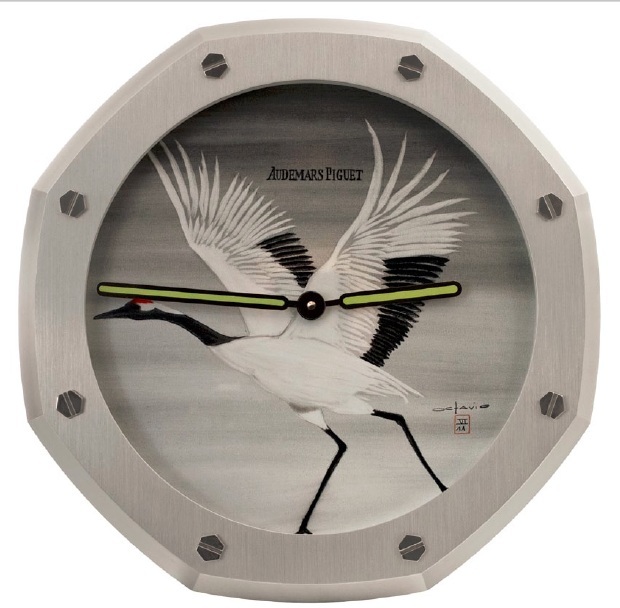 One of the clocks, for example, designed by Audemars Piguet’s Chief Artistic Officer Octavio Garcia, features a painting of a Japanese crane, which is commonly recognized as a symbol of hope, happiness and longevity in the country’s culture. The Royal Oak Wall Clocks were gifted with the intention that the employees of Audemars Piguet Japan could do with the clocks as they saw fit. 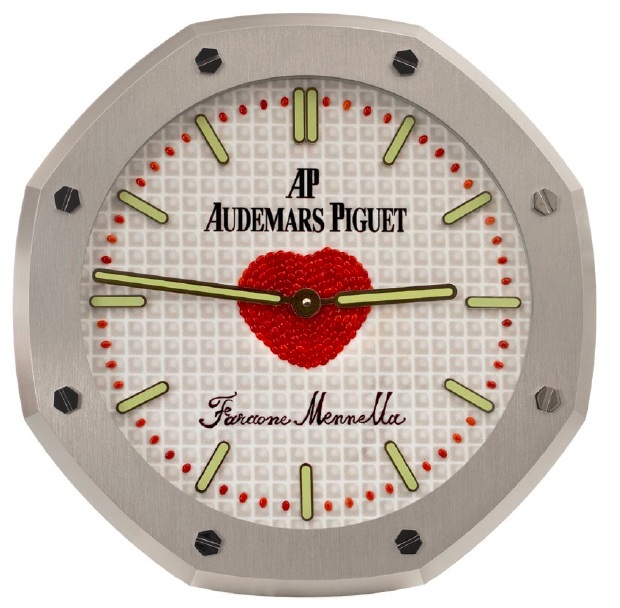 For some time, the clocks were on display in Audemars Piguet Ginza Boutique in Tokyo, until the division decided to auction them in support of ongoing earthquake relief efforts. The auction began on June 1, 2012 and will continue until July 16 the following month. Audemars Piguet is currently celebrating the 40-year anniversary of its Royal Oak Wall Clock with a world-touring exhibition. 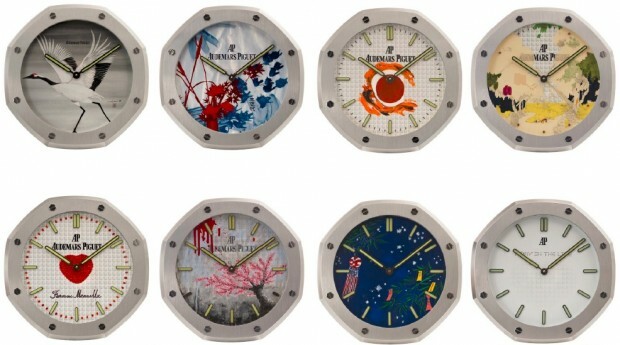 The eight “Support Japan” clocks will be displayed with the exhibition when it comes to Tokyo from July 11 to 16 and will be given to auction winners directly after. The proceeds of the auction will go to the Japan Red Cross Society, contributing to Audemers Piguet Japan’s “Support Japan” initiative to raise 100 million yen (approx. $1.3 million) for the organization. Royal Oak has become an icon, seen both in watch and clock form from Audemars Piguet. Each of the “Support Japan” clocks features the classic eight screws around the rim of its rounded octagonal shape, two luminescent hands and the Audemars Piguet logo. Combining great aesthetic and sentimental value, these “Support Japan” clocks are expected to raise substantial amounts for Audemars Piguet Japans’ fundraising initiative. Inspiring hope and emotion, the gifting of these special Royal Oak Wall Clocks has demonstrated Audemars Piguet’s ability to display unity and support amongst its global sectors. The Bell & Ross company originated as a team comprised of an engineer and an aircraft navigation specialist who joined forces to design a high quality timepiece that would be resilient enough for professional use while maintaining the integrity of a superior watch. Many years later, Bell & Ross would be known worldwide as a superior horologist whose timepieces are the top choice for many professionals such as divers, pilots as well as explosive ordinance disposal specialists. Those who are in the line of high pressure work can appreciate the quality, design and functionality of any Bell & Ross timepiece. All watches created by Bell & Ross reflect their four fundamental principles of design: water resistance, precision, performance and reliability. 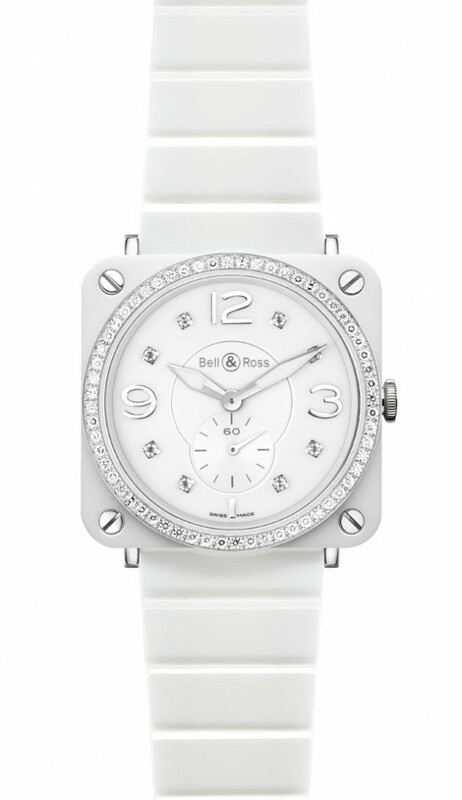 Recently, Bell & Ross introduced the BR-S Phantom timepiece which is a sleek and stylish women’s watch. This timepiece is not your typical ladies watch with delicate features or loud colors; the BR-S Phantom radiates understated elegance with an ultra-modern look and clean lines. The gorgeous timepiece is available in black or white and ladies have the option of choosing a watch accented with diamonds or a more edgy, minimalist watch without any added extras. 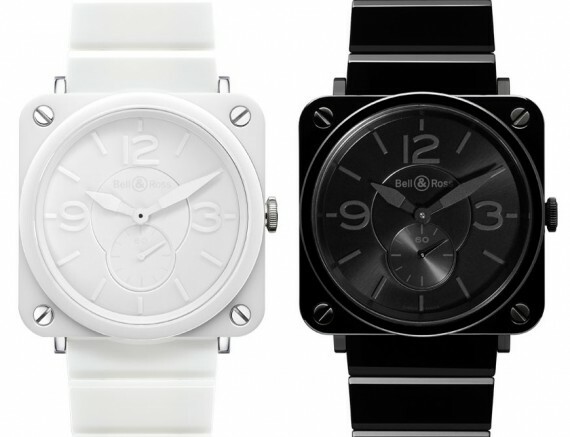 The BR-S Phantom has taken the basic ceramic watch to the next level with its monochromatic design and features. 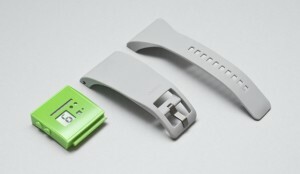 The timepiece comes set in either a beautiful stainless steel, ceramic or rubber bracelet. Although the two bracelets differ greatly in appearance, all of the straps perfectly complement the classic ceramic case. As with all of Bell & Ross’ classic timepieces, the BR-S Phantom is water resistant to 150 feet, has Quartz movement and scratch resistant sapphire crystal. The piece measures 39 millimeters by 39 millimeters and can easily be worn for casual days or night out. Arabic numerals are featured at 12, 3 and 9 o’clock with a petite seconds subdial placed at 6 o’clock. The remainder of the dial on the timepiece features luminescent hour indexes that harmonize well with the monochrome theme of the watch. Ceramic watches have gained much popularity as they are heavily scratch-resistant, durable and will not rust like their metal counterparts. Ceramic watches are also very trendy and stylish for the modern man or woman who craves the quality craftsmanship of a luxury watch without the fuss of a highly decorated timepiece. Ladies who desire a minimalist luxury timepiece that can still command attention with its edgy features will appreciate the BR-S Phantom’s unpretentious and super cool manifestation. The future of timepieces is here. Nooka Inc., a New York design company most known for its innovative wristwatches, has recently introduced its newest addition to the Zub family. The Nooka brand, though not well known or sold in major stores, has received considerable attention since its creation in Dec. 2004. With its first client as the Museum of Modern Art in New York, and current collaboration with companies like Nickelodeon, MTV, and the counter-culture toy store, KidRobot, the brand’s unique approach to timepieces in particular has caught the attention of artists, rappers, and everyday watch fans. monochromatic schemes said to promote the brand values of customizable mood and style. The newest piece, the Zub 40, takes this founding idea to the next level by introducing four color schemes and interchangeable bands. “I thought if one has to be taught how to tell time, how intuitive is it really? Surely there are other models, once learned, that can be as intuitive as what we are taught,” says chief designer and founder, Matthew Waldman. Waldman instills a core set of values in his brand: Universal communication, passion, interaction, purpose, inspiration, and most prominently, futurism. The products—which also include accessories such as belts and wallets—follow this “Nookafesto” which necessitates every product be a physical manifestation of an idea that surpasses ordinary expectations of everyday objects. With a concept that was born in London, first produced in Japan, and is now headquartered in New York City with an office in Tokyo, the Nooka fashion design company has built upon Waldman’s initial theory by creating an eclectic universe of conceptual products that are both pleasing to the eye and enlightening to the mind. Whether you’re looking for a new way to look at time, or are just in need of a new watch, the future is clear—visit Nooka’s website to pick out an accessory that breaches the concept of time as we know it. Oct 29 Get Blown Away At The Swiss Legend Watches 24 Hour Blowout Sale! The Swiss Legend 24 Hour Blowout Sales event is on at Watches on Net! Don’t miss the chance to get in on the biggest savings on Swiss Legend ever. For the first time, Watches on Net is offering Swiss Legend Watches and to kick off this exciting event, they will be holding a 24 hour Blowout Sales Event that you can’t afford to pass up. The savings on these exceptional timepieces will be unlike anything you have ever seen and to make the deal even sweeter…Watches on Net will throw in free ground shipping, as well! The energy surrounding this sales event is phenomenal and so are the prices. Watches on Net, who already carries major brands like Cartier, Gucci, and Hermes is thrilled to be able to add the Swiss Legend line to their collection of luxury watches. Swiss Legend is an incredibly fashionable luxury watches brand. They are Swiss made and as elegant as they come. Get your Swiss Legend fix today at the 24 hour Blowout sale! Pick out a beautiful new Swiss Legend timepiece! Get in on an amazing deal! 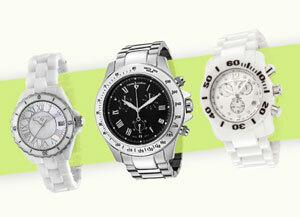 Take advantage of Watches on Net’s free ground shipping offer! The next 24 hours could give you a lot and save you plenty!